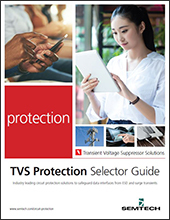 RailClamp® TVS arrays are low capacitance ESD protection devices designed to protect high speed data interfaces. The RClamp®1255P provides dedicated surge and ESD protection for USB ports. It is designed to replace multiple discrete components in portable applications.